TWO THINGS TODAY: Old trumpets still work and are great instruments for your child, and Angus doesn't forget. We had a mom, and we won't use her real name but her initials are Amanda VanNess, come in yesterday with an old trumpet and violin. She wondered if her daughter, Olivia, would be able to use either instrument for school band. You know, our favorite from the hood, Ms. Olivia. Sheryl went over them and made sure everything worked on both instruments. Olivia decided to play the trumpet, and last night she promptly took it outside and started blasting away in the front yard. Dogs and cats were scattering, cars were crashing and people were holding their ears. Well ... not really. But the neighbors did come out and wonder what the heck was going on. "Better get used to it," Amanda warned. Amanda came in with her 10-month-old daughter, Emma, who looks just like her big sister. 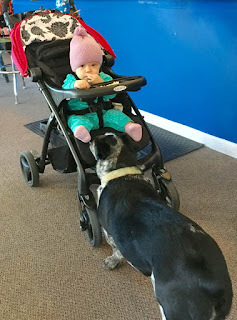 Yesterday Emma spilled some cereal from her stroller and Angus got wise in a hurry - baby alert! Baby alert! Spillage and treats! Angus is pretty sharp, and as soon as mom and baby walked in this morning, he was right there in front of the stroller. More cereal got spilled. Angus made sure we didn't have to vacuum. Emma found more cereal behind her bum and threw that for Angus too. A pair for sure. The moral of the story is, mom and daughters are happy, and so is Angus. So everything is right in the world, and we continue to rock at Fifth and Maine during school band instrument season. Angus sez, "Bring more babies and treats!"